Here is a sampling of the delightful treasures that were raffled off in previous years at Pagan Pride Raleigh! We have two raffle pulls each day, at 1 and 5. Tickets are 25 cents for 1, or 5 for a dollar. What will you win this year??? Our generous friends at Starrlight Mead have done it again! They have are offering mead tastings for four people. Raise a glass and celebrate life with friends! $28 value. It's time to get your alchemy on! Dancing Moon is offering a porcelain mortar and pestle. What trouble will you mix up? $25 value. Stuffed with a spell and herbs associated with love, this little goddess is a spirit doll crafted to bring love and peaceful energy into your life! Use the doll along with the mini dream pillow (stuffed with a spell for sweet dreams) to let a little magick into your life! $16 value. Embrace the magick and power of the unicorn with your very own unicorn spirit doll! Handmade from soft fleece, the doll is stuffed with non-allergenic polyfil, herbs, and a spell for magick and energy. Let a little magick into your life! $22 value. White Hart Creations harvested this shell from Bear Island and look who was inside! 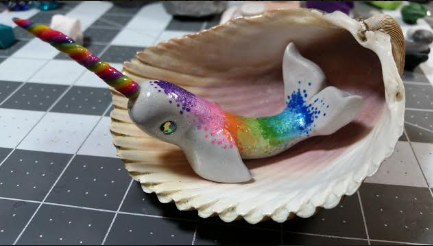 You know you want some rainbow narwhal magic! This handcrafted Faerie Orb makes a great gifts for all ages. Beautifully decorated with beads and bells as well as being filled with all kinds of items Faeries love. Hang in a special place in your home and enjoy the orb as much as the Fae do. $35 value. From Sosanna's Closet: “Always be yourself. Unless you can be a Viking. Then always be a Viking.” Green long sleeved XL shirt. $25 value. Itty Bitty Witch Cthulhu is ready to go home with you! This little Cthulhu features a black, sparkly hat and sits on a 1" wooden base. This Itty Bitty Cthulhu retails for $20. Bewitching Dreams features an assortment of Itty Bitty Cthulhu's, each with their own personality. Every sculpture is handmade and unique, so no two are exactly the same. Like snowflakes, but with more tentacles. A hand-sculpted tentacle branches upwards, assisting the accompanying basil plant during it's growth. Or maybe it's just plucking a leaf for it's favorite pasta dish! The tentacle is constructed of a sturdy clay that is extremely durable and is waterproof, weatherproof and safe for indoor/outdoor use. The base of the tentacle is coated in a flexible silicone coating to give further protection to the elements. This package is $18. Bewitching Dreams has an assortment of hand sculpted and unique garden decorations, that make great and whimsical gifts! A delicate byzantine bracelet with two-tone rings and adjustable links for the perfect fit. These bracelets are lightweight and look beautiful with any outfit! The Dragon's Hoard has a wide variety of unique and beautiful handmade chainmaille, scalemaille and leather jewelry, accessories and bags. San Diego’s renowned Tenth Avenue Theater is home to an unlikely cast of ghosts, but what has kept the spirits of the dead bound to this venue of entertainment and illusion? From apparitions of a child who died a tragic death to the spirit of a suicidal pastor, there is grief, turmoil, and unfinished business lingering within the walls of this former church. Investigating the popular and thriving theater she has always considered home, Alex Matsuo unravels the turbulent history of the building in order to find out why the ghosts of the Tenth want to stay forever. Value $15.99. From Raven Feather Glass Creations: Owl Night Light! What better way to light your way at night than with this cute little night bird? Purple and Yellow, includes bulb. From Faeline's Fineries comes this beautiful baby quilt, valued at $125.00! WOW! Tree of Life Designs is donating wonderful Smudge Kits.